The smallest superhero of all! Ant-Man from the Captain America: Civil War movie. Previews Exclusive Egg Attack Action figure. Includes highly movable joints, a switchable hand, and a mini Ant-Man figure! Continuing Beast Kingdom's line of Egg Attack chibi action figures, this Captain America: Civil War Ant-Man Egg Attack Action Figure - Previews Exclusive is poised to present Ant-Man from the blockbuster Captain America: Civil War movie. The figure is designed with highly movable joints so it can assume a wide variety of positions. It also features a switchable hand, allowing you to re-experience the thrill of Ant-Man changing sizes. The helmet's metallic color and texture, as well as the detailed costume, come straight from the film. The mask piece uses transparent materials to accurately capture the character's expressions. 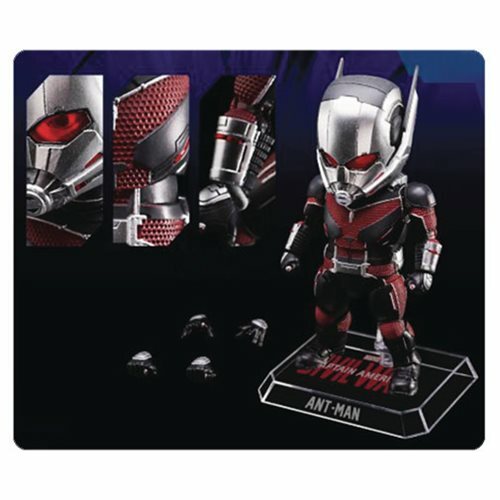 Ant-Man also comes with mini Ant-Man, who is only about 1 2/5-inches tall. His running pose can interact with other figurines of the same series (sold separately) so you can imagine this size-changing hero literally running all over the rest of the Avengers. For the first time ever, Beast Kingdom's Egg Attack Action series introduces the smallest superhero of all! Ages 15 and up.